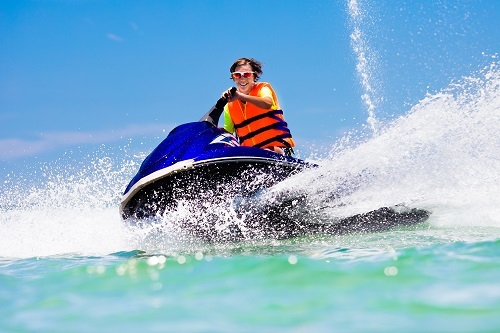 One good thing about jet skis is that they offer a thrilling on-water experience for riders as they navigate through oceans, lakes, and rivers. Whether you are riding one because you simply want to take a leisurely ride at a much slower pace or perhaps you want to ride the waves at a speed of 50 miles per hour, you will find jet skis in different designs and styles to meet your needs. When you have purchased your own jet ski, don’t forget to practice the many different riding methods so you can build and improve your jet ski driving skills and have more fun while making sure that you and your passengers are safe. Some of the most commonly used jet ski riding methods are provided below. A lot of jet ski owners prefer the stand up riding method is because it lets them have more control over their jet ski. It also allows them to use their legs to take in the shock that comes with large waves. This is done by placing the feet a bit far back from the handle bar of the jet ski and slightly behind the rider’s shoulders. You also need to be in a semi standing position with your knees bent a bit so you will be able to handle the rough water better. When you turn and jump the jet ski rental, be sure to lean. Many jet skis provide a comfortable ride whether you are cruising an ocean, lake, or river. The very best way to cruise is to take a seat with your feet placed forward on the footrests while keeping your back slightly bent. This will allow you to absorb the shock of the waves better. By sitting in this position, you will also be able to lean along with your jet ski as you turn. You will also be able to turn more efficiently and lower your risk of falling off. If you see that the water is slightly choppy or calm, you should not let this time to pass without cruising with your jet ski. When you are riding your jet ski, always be mindful of other jet skis and boats around you. Always look behind you before you make any turns. Jet skis are very nimble and you can easily turn on a dime. Don’t ruin your day by turning in front of a water craft that’s following you. The handle and the riding techniques to keep safe will change significantly if you ride a jet ski with at least one passenger. First of all, the additional weight will make turning the jet ski harder and needs your passenger to lean into the corner simultaneously. In case you want to have more than one person riding with you on your jet ski, make sure that they are all securely on well before you accelerate from the dock. The passengers must also stay seated and not make sudden movements because the Myrtle Beach jet ski rental is a lot less stable because of the extra weight. Another riding technique you have to master is docking. How you dock your jet ski will depend on the kind of dock you have. When you approach the dock you have to decrease the speed of your jet ski to an idle to lessen the risks of colliding or any accident on the deck. Although you might have decreased to an idle before as you prepare to dock, there are instances when you still have more forward momentum to comfortably dock your jet ski. One quick tip to lessen your forward momentum is to do a hard 360 degree turn at about 30 feet in front of your landing or docking area. This will help reduce the forward momentum and let you dock at a much more comfortable speed. As you come near the shoreline or the dock, switch off the engine of your jet ski and let it coast to the area where you will secure it to a lift or pier. It is also important to remember that when you switch off your jet ski, you can no longer steer it. Exit the jet ski once the water is shallow enough for you to get to the ground safely and prevent the jet ski from running onto the shore. In case it is a deep water dock, approach the dock slowly, switch off the engine before you make contact with the dock to shut off the jet ski. The weather here has been very warm and with lots of sunshine, The beach area was not affected by the storm – great time to get out and try jet skiing. Call Action Water Sportz if you are looking for a jet ski rental.